Come enjoy the sunflower circle at City Park ! Stories amid the sunflowers with Belfast Library children's librarian Erica Rubin Irish and sunflower crafts. 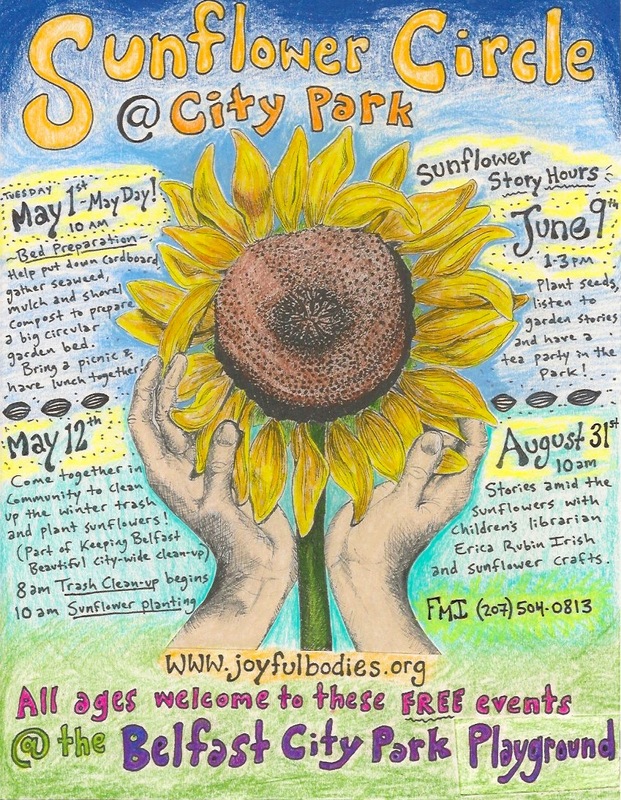 Come plant seeds, listen to garden stories, sing garden songs and have a tea party in the park ! 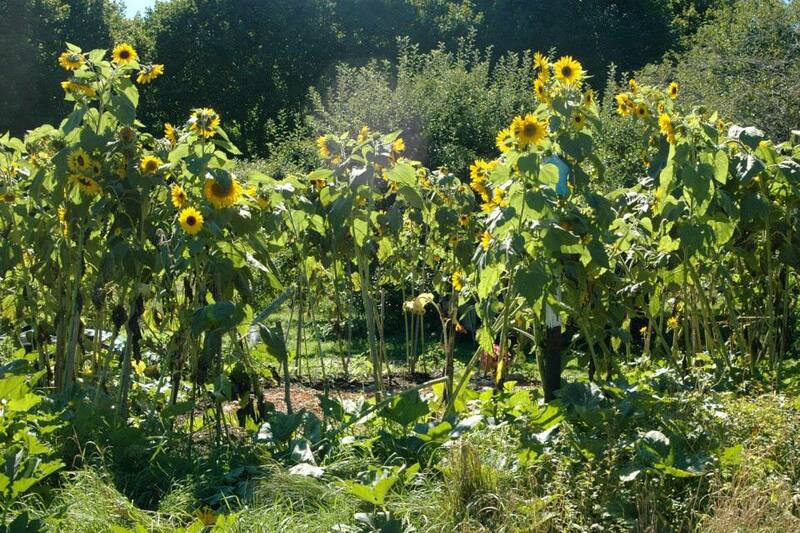 Come together in community to clean up the winter trash and plant sunflowers ! (Part of Keeping Belfast Beautiful city-wide clean-up) If it's warm, bring a picnic and have lunch ! You can come for a single session, or for the whole day. Facilitated by Chelsea Cartwright: Chelsea believes in going at your own pace, honoring every corner of your being, so we can fully embrace ourselves and our world. She delights in being able to share honestly, be witness and hold space for others to share, and to explore with curiousity our aliveness and ability to move and be moved, listen and express alone and in community. What to bring: yourself, willingness, water bottle (there will be springwater available), soft clothes for moving in without buttons and strings, layers, snacks and anything else you need to be comfortable. A light breakfast will be provided, but lunch and dinner are out & about, or bring your own. If you're From Away ... and need a place to stay the night before or the night after, please let me know. I will set you up with local sleeping space. A space for connection and sharing, a time to be present with one another in all our humanness. The weekend is a structured improvisation in intimate community in a beautiful place. Moving, speaking, singing, dancing from our hearts & guts, we will be co-creating the experience. How do we dance in the world? What is the culture we are creating? How do we relate with our environment? Chelsea brings together explorations in meditation, contact improv dance, Authentic Movement, yoga, bodywork, women's circles, community building, event organizing, grief and trauma, singing & sounding to help create a vibrant, held space for connection and movement. She is delighted to be riffing off of the Jam Jam weekend that Abbi Jaffe and Amanda Franz have been co-creating at Dharma Door Retreat Center in Underhill, Vermont, to bring more opportunities for conscious community movement to Maine. She lives with her four-year-old son in Belfast, by the sea. Mandy and Ryan gave up their corporate jobs and traditional houses to "bike-pack" thousands of miles. Their journey and their film answers the question that they and many others are asking: Is it possible for all of us to live sustainably? After touring the country, and talking with over 20,000 people they have found that not only is it possible, it is already underway. In honor of the theme of dance in community, there will be a short dance performance by Droplet Dance (Molly Gawler & Lao Gillam) before the film. Tickets are $10 in advance, $12-20 sliding scale at the door. Kids are FREE! NOTE: Ticket price is included in full registration for the Moving Explorations in Community event. This event is part of the larger event Moving Explorations in Community. “Moving Explorations in Community (ME in Community): A weekend of dance, discussion, documentary, meditation & music"
A celebration of dancing on the Earth, this event will be a step toward forming an ongoing contact improv dance community and jam in midcoast Maine. It is an opportunity to explore ideas for nurturing intentional dance community in Maine ~ from deepening the web of connection between movers, to the possiblity of creating a sustainable community with a green dance space. This event also launches the book and discussion group The Joyful Living Collaborative. Friday (22nd) Earth Day ! * "Within Reach" is the documentary of a couples bicycle journey circling the United States in search of sustainable community. Children welcome Friday night, no separate program, parents responsible.